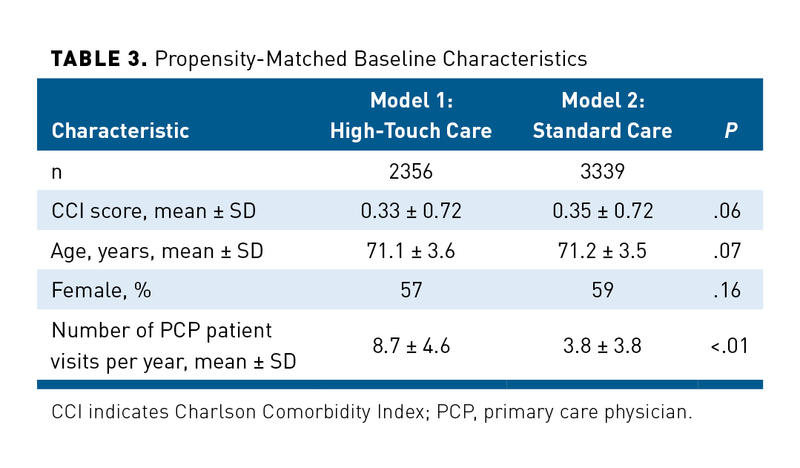 The aim of this study was to evaluate the impact of a high-touch model of primary care on healthcare utilization among Medicare Advantage patients compared with a standard practice-based model. 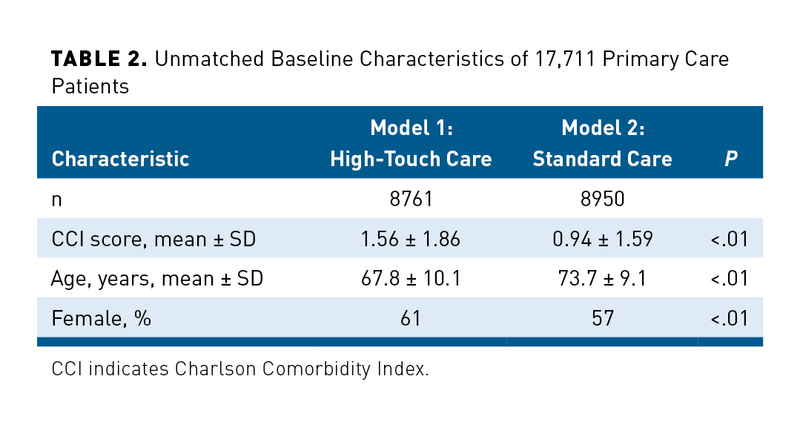 We conducted a retrospective cohort study to evaluate the clinical and economic effects of 2 models of care: high-touch care versus standard practice. Both models of care included only seniors with Medicare Advantage insurance. The study was approved by Western Institutional Review Board (IRB) and the University of Miami IRB. The high-touch model (model 1) is a high-intensity primary care model4,5 that delivers care through very frequent patient–provider encounters aimed at preventing or delaying the occurrence of complications of chronic conditions. Chen Senior Medical Centers is a multispecialty organization spread over 7 states. Its model of care is based on the following pillars: (1) a preventive cardiovascular program9,10; (2) in most states, on-site medication dispensing by providers; (3) smaller patient panels of approximately 450 patients per primary care physician (PCP), allowing providers to spend more time with each patient; (4) very frequent encounters, with a mean of 189 minutes per year of face time3; (5) an advanced electronic health record (EHR) system; (6) courtesy transportation for all patients; and (7) walk-in hours. We included all Chen Medical members who had Medicare Advantage plans and were seen in any of the Chen Medical practices between January 2, 2014, and March 27, 2015. The control model (model 2) delivers care at a frequency consistent with usual marketplace benchmarks. This site is also a multispecialty practice that has a main campus and 2 other satellite offices. Although the control groups’ practices offer a traditional model of care at their centers, they do offer (1) preventive services, such as bariatric weight loss surgery; (2) an in-house pharmacy where prescriptions can be filled using an online link; (3) limited laboratory tests and basic x-rays; (4) an EHR system that is accessible to their patients; (5) close PCP follow-up, with mean face time of 90 minutes per year; and (6) access to care that involves walk-in hours and an urgent care center that is open on weekends and holidays. However, model 2 does not offer courtesy transportation to its patients, has larger patient panels, has patients seen less often by their PCPs, and does not have transitional care teams (Table 1). Our primary outcome was healthcare utilization. We defined healthcare utilization as total healthcare costs and the number of hospital admissions. We collected annual healthcare utilization costs based on the total incurred costs (medical and pharmacy) during a 12-month period. We added the costs from the medical claim files of both models of care. The total healthcare costs represent the costs incurred by the health benefits company and the member’s responsibility. We reported per member per month (PMPM) costs.11 We also collected hospital admissions during the same 12-month period.12 We counted all admissions to any hospital. For medication use, we calculated in the propensity score–matched groups the differences between those using specific medications in models 1 and 2. The fitness of the data was assessed using the deviance ratio. Analyses were performed using STATA 14.0 (StataCorp; College Station, Texas), and all significance tests were 2-tailed. Tables 2 and 3 show the unmatched and matched baseline characteristics. We included 17,711 unmatched primary care patients. Both groups had significant differences in CCI score, age, and gender (P <.01 for all). We were able to match 5695 patients from both models of care. The characteristics used for matching—namely, CCI score, age, and gender—were similar when comparing both types of models of care (P >.05 for all). The mean number of primary care visits was higher in model 1 of care compared with model 2 (8.7 ± 4.6 vs 3.8 ± 3.8; P <.01). 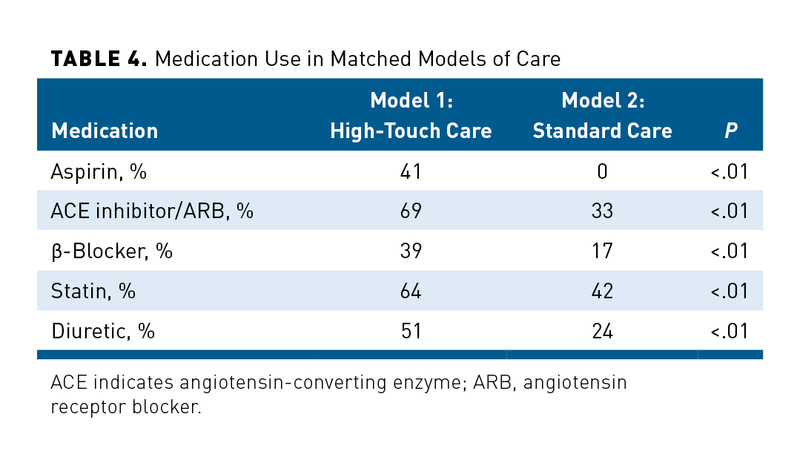 Table 4 shows medication use by model of care. Medications were used more frequently in model 1. The absolute differences in percentage points (PPs) were 41 PPs for aspirin, 22 PPs for statins, 36 PPs for ACE inhibitors and ARBs, 26 PPs for β-blockers, and 22 PPs for diuretics when comparing models 1 and 2 (P <.01 for all). Table 5 shows healthcare utilization by model of care. 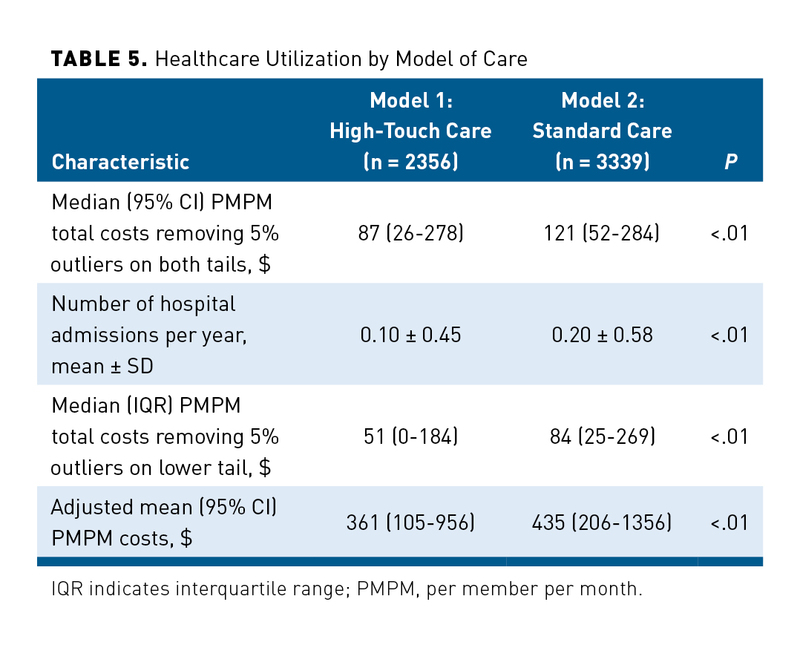 The PMPM healthcare costs for model 1 were $87 (95% CI, $26-$278) compared with $121 (95% CI, $52-$284) in model 2 (P <.01). The mean number of admissions was lower in model 1 (0.10 ± 0.40) compared with model 2 (0.20 ± 0.58; P <.01). Our study found that in a propensity-matched sample of seniors insured through Medicare Advantage, those who received high-touch care had lower healthcare costs and fewer hospitalizations than a matched group of patients receiving standard care in a similar value-based model that attracts patients who are clinically high-risk. Care model 1 had a higher number of encounters between patients and providers and was associated with higher use of cardiovascular medications. A second potential explanation for the healthcare cost reduction seen in the high-touch model is that it may allow the more timely diagnosis of ambulatory care–sensitive conditions (ACSCs), leading to a lower mean number of hospital admissions, an important driver of healthcare costs.22 Common causes for hospitalization due to common ACSCs include lack of or delayed access to care, suboptimal monitoring, and medication nonadherence. Therefore, recommended strategies to avoid such hospitalizations include those that are intrinsic parts of a high-touch model: easy access to care, monitoring of outcomes and medication adherence, transition teams, and communication among providers. Third, because patients in the high-touch care model were seen more often than those in the standard care model, they may better adhere to other preventive care strategies, such as vaccination or cancer screening. The role that high-touch models of care can have in avoiding hospitalizations for ACSCs and in preventive care needs to be rigorously studied. Our study also offers insights regarding which components are pivotal for high-intensity primary care programs. Those programs were proposed to manage medically complex and high-cost patients in an effort to decrease costs and provide better quality of care. A systematic review of the literature6 that included 379,745 participants and defined high-intensity care as primary care replacement (home-based care or clinic-based replacement) or primary care augmentation (by adding an interdisciplinary team) found varying degrees of effectiveness in reducing hospitalizations and limited evidence of improving mortality. The premier example of those high-intensity primary care initiatives is the Veterans Affairs Patient Aligned Care Teams model, which provides an integrated care team approach but found a modest increase in costs. A potential explanation is that veterans averaged 2.3 primary care visits per year, which may be insufficient to offset the costs of the program. To our knowledge, there is no literature evaluating the effectiveness of a high-touch model of care. This may be explained by the recent emergence of the term “high-touch.” However, there is evidence that increasing primary care visits improve colorectal cancer screening rates,25 hypertension diagnosis,26 reduction in dialysis-related hospitalizations,27 and cardiovascular risk factor control,28 which supports our findings. Our study contributes to the literature by comparing 2 models of delivering care to Medicare Advantage patients and revealing that among elderly patients, a higher frequency of patient–provider encounters can facilitate more effective care. Evaluating patients more often increases preventive and therapeutic opportunities and may improve the patient–physician relationship. It also provides concrete guidelines for practices seeking to implement high-touch care with respect to panel size, frequency of visits, and services provided. Our results should be viewed in the context of the following limitations. First, we matched for a limited number of factors known to affect the outcomes and could not match for other variables such as cardiovascular risk, social determinants of health, and principal diagnosis. However, we did match for the most important contributors to costs, such as comorbidity burden and age. Second, we had access only to claims data for both models of care; therefore, our analysis is subject to information bias. For this reason, we could not report on intermediate clinical outcomes, such as blood pressure or diabetes control, limiting our ability to test mediators of reduced costs. Third, the generalizability of the results is applicable only to at-risk practices that care for Medicare Advantage populations. 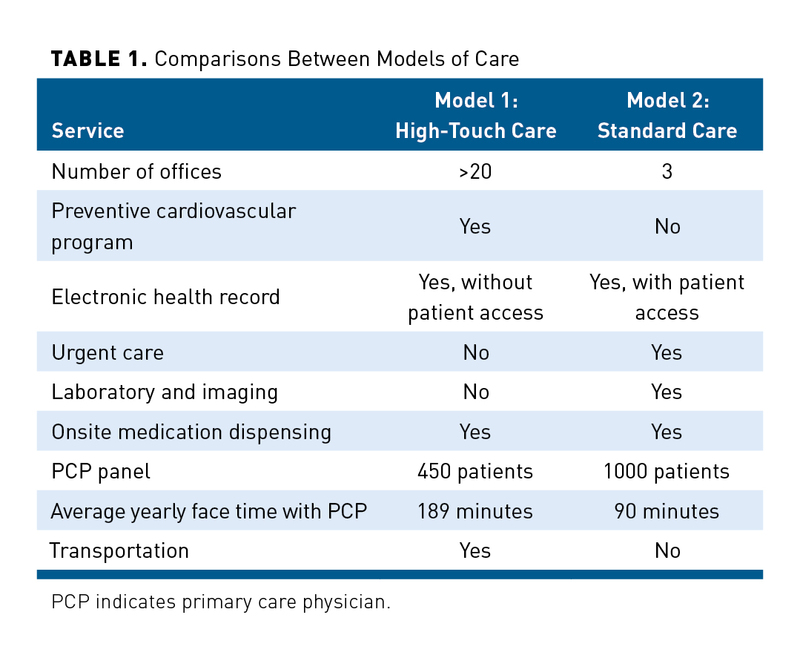 Fourth, as in other high-intensity models, the high-touch primary care model tested in this study has components other than visit frequency that may play a role in outcomes, such as provider delivery of medications, in-house specialty care, and patient transportation. Our study provides evidence that a high-touch preventive model providing frequent and easy access to primary, specialty, pharmacy, and ancillary care can improve healthcare utilization and reduce healthcare costs in spite of higher frequency of outpatient visits in a senior population. Future studies should evaluate the impact of this model on outcomes such as patient experience, medication adherence, and clinical outcomes.